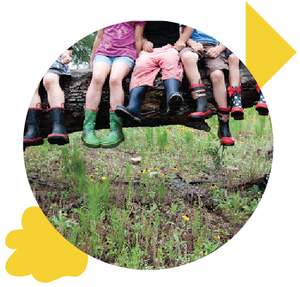 A new unschooling and peaceful parenting space called Austin Yawp! has emerged in the past few months, so I decided to grab the opportunity to learn more about it by talking with Hannah Ford, one of Yawp!’s founders. Although unschooling has been around as an alternative education option at least since the 1970s, the concept is new to me (but not to my sister and Alt Ed Austin founder Teri), so I began by asking about some basics. What exactly is unschooling? Hannah explains that unschoolers allow kids to learn naturally, without an imposed curriculum. “You work together as a family, and kids are empowered to make choices just like adults are able to make choices. We respect children, and we trust them.” She says that it’s a little crazy that the world believes everyone needs a piece of paper and test scores to prove they are learning, when learning is such a fundamental, natural process. Hannah emphasizes that although she favors unschooling, Yawp! welcomes families pursuing a whole variety of approaches to learning, including various forms of homeschooling, alternative schooling, and even public school. “And it’s really nice to meet other families on neutral ground, where no one has to worry about tidying up the house, and there’s no one hushing you, as you might have at a library or coffee shop,” says Hannah. A typical day at Yawp! includes some planned events as well as open drop-in hours when families can meet to pursue any activity that interests them. Kids have met up for Minecraft, to create elaborate cardboard houses, and to play with DIY light sabers. The space has also hosted Raising Resisters, a parent discussion group that focuses on anti-oppressive parenting and education tactics. Yawp! currently operates in a small space in the Mueller neighborhood, and they are planning to expand to a second location that will offer more room and a better outdoor play space. Watch their Facebook page for more details and information about upcoming events. And to learn more about activities, visiting, and the member agreement, check out the Austin Yawp! website.